Last year I made some long range predictions saying that 2010 will be the turning point for a few trends. I was not saying that on December 31st, 2010 (today!) you will sit back and say I am right on all of these, but I was saying that by December 31st, 2011 or 2012 you will. The trends I spoke about last year are: .NET has hit the end of the road, BI is the next big thing, the cloud will emerge, Google and Apple will go to war, and content providers will strike back. I still think these trends hold true. It looks like #4 (Google v Apple) and #5 (Content Providers strike back) already started to happen in 2010. Windows Phone 7 (WP7) is playing catch-up and will start to gain some market share in 2011. While it will still be a distant 3rd place behind Android and the iPhone in the “Smartphone” category, it will shine in one area: apps. There are tons of apps out there for both iPhone and Android and only very few for WP7 as of this writing. That will change, and one story this year will be the explosion of quality apps for WP7. We are already seeing great growth in the Windows 7 Marketplace. Currently there are over 5,000 apps in less than two months since launch. It took Android over 5 months to get to the 5,000 number. 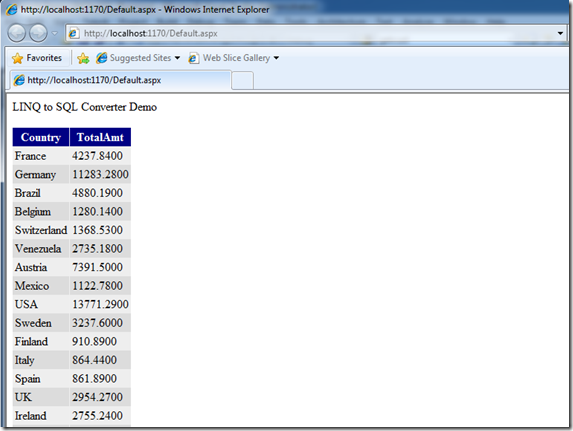 WP7 has well over double the speed of the growth Android had at launch. While this does not mean much, if the trend continues as I think it will, Microsoft’s phone will have the most apps within a couple of years. Developers build applications on a platform for two reasons: the platform has reach and it is easy to develop for. WP7 will have broad reach as it gains market share this year and developer ecosystems are in Microsoft’s DNA, not Apple’s and Google’s. While developers will continue to develop for the iPhone and Android, within two years, WP7 (or 8?) will have the most applications. Both the XBox (XNA) and Silverlight platforms to develop on are quite easy and already have a tremendous amount of developers. While Windows 7 is the most successful operation system Microsoft has shipped to date, we will see a Windows 8 beta this year, most likely at the PDC in the fall. Speculation is that Windows 8 will be based on HTML5 and not have any support for Silverlight included, a hint as to where Microsoft has put its priorities. My bold prediction is that while HTML5 will be “everywhere” in Windows 8, Silverlight will ship as part of the core OS, putting it on equal footing with HTML5 in Windows 8. Later this year Office 365 will launch and compete head on with GoogleApps. Microsoft has the model right, online applications that integrate with the locally installed ones, Exchange integrations, and managed support. At $6 per user, your business can have a fully functional Exchange, Sharepoint, and Office solution without any IT costs. GoogleApps are good, however, they can’t compete with what Office 365 is offering. We continue to push the envelope and drive innovation in our existing products. Our products won several awards in 2010, including the industry standard JOLT awards, Best of TechEd 2010 and “Best” by the Visual Studio Magazine Awards. Telerik was also selected as a Red Herring Global 100 company, the “Best Company to work for in Bulgaria”, and was a finalist in the prestigious European Business Awards. In 2010, Telerik reached more customers at events this year. Our team traveled to all four corners of the globe to visit customers. For example we had speakers and booths at five TechEds in the USA, Europe, Australia, India, and Brazil. We sponsored major events in North America, South America, Europe, Africa, Asia, and Australia, visiting customers in some familiar places (such as Las Vegas) and some new ones (Brazil and Hong Kong). Besides the big events, we also sponsored and spoke at several CodeCamps, user groups, and other events around the world, including DevReach in our own backyard. Our evangelists and marketing teams would even travel to Antarctica to visit customers! Looking forward to 2011, we hope that the world economy and the general business climate improve. 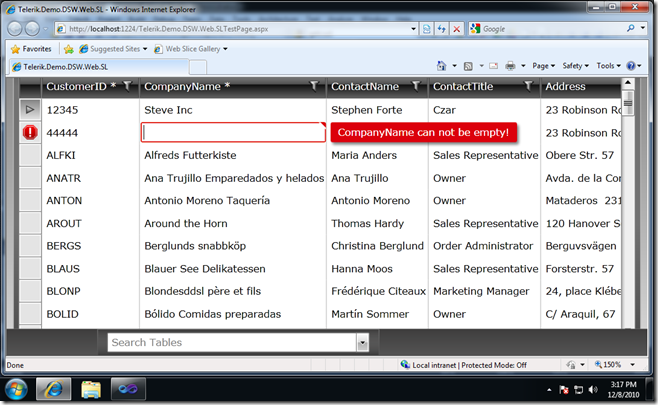 We have some great releases of our products planned, such as SiteFinity 4.0 in January and our Q1 2011 release in March. We have a brand new product that is currently top secret, but you’ll get a preview of it soon. We also plan to open some more offices worldwide as well as attend and sponsor even more events. We are hitting the ground running in 2011, we are putting on an event in Pune, India in January. We hope to see you in person in 2011 since we do this all for you. I want to close by thanking all of you, our customers, for your dedication and support. Happy New Year! If you are creating OData or WCF services in your application and have been using the Telerik Data Services Wizard, things just got a whole lot easier. As I have shown before, you can go from File|New to a new CRUD application in 30 seconds using the wizard. 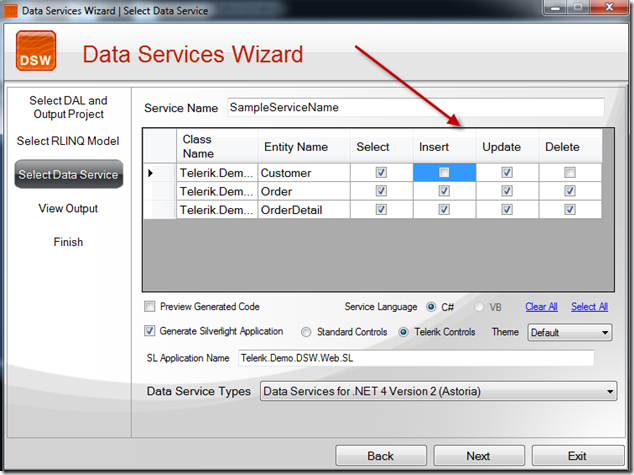 With the Q3 release last month, Telerik gives you more control over the wizard and its output. Some of the new features are: the ability to isolate your service in its own project, the ability to select which CRUD methods gets created for each entity, and Silverlight data validation. Let’s take a look. When you run the wizard, on its first page you now have the option, as shown here, to separate the service in its own class library. 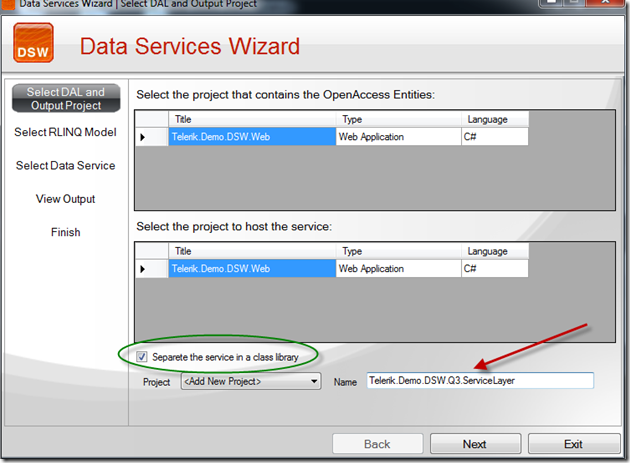 You can check the checkbox and type in a project name and the Data Services Wizard create the implementation files for the service in this new class library for you. In previous versions of the wizard, the wizard would create all of the CRUD operations for you automatically. We received feedback from customers that said they would like more control over this process, allow some entities to be read only for example. The Q3 version of the wizard now allows you to select which CRUD methods to generate for each entity. Lastly, if you choose the automatic Silverlight application generation, the wizard will read the database validation rules and replicate them as client side validation rules, saving you a lot of configuration and coding! Enjoy the new wizard’s improvements! 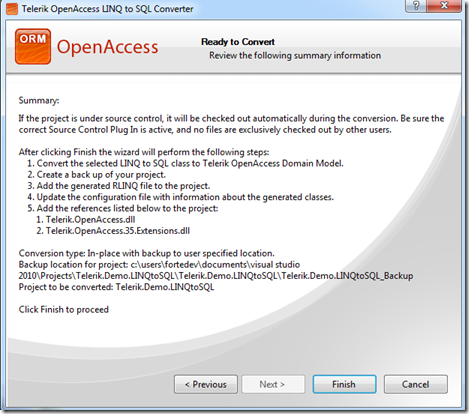 If you are currently invested in LINQ to SQL and want to upgrade to Telerik OpenAccess ORM, with the new OpenAccess Q3 release you can do this quite easily. 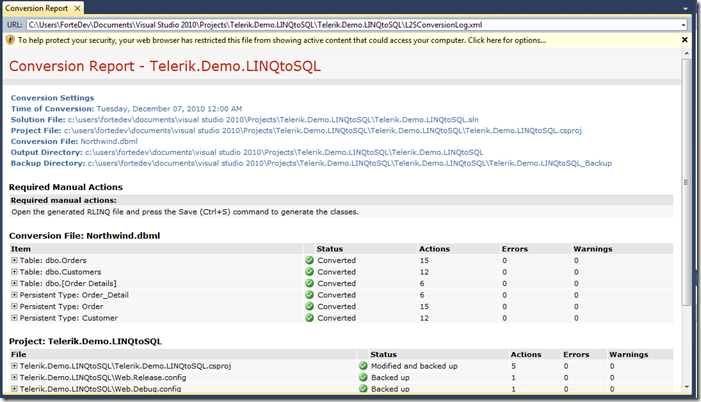 There is a new wizard included with OpenAccess that will automatically convert your LINQ to SQL classes to Telerik LINQ classes. Let’s take a look. I’ll start with a simple project that has a simple LINQ to SQL model in it: Northwind.dbml. It is mapped to the Northwind database tables. I created a simple web form that has a GridView on it. I decided that I would try to stump the wizard by writing a complex LINQ statement, one with aggregates, joins, sums, and projections to anonymous types. Then I take that code and bind it to the GridView. The LINQ code is shown here. Conversion time. Doing the convert is simple and done in place. 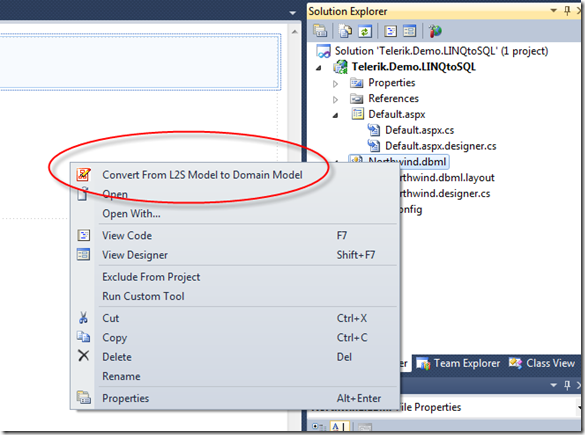 Just right click on the LINQ to SQL model and choose “Convert From L2S Model to Domain Model” from the context menu. This will bring up the OpenAccess Conversion wizard. In reality the wizard is one page. If you accept the defaults, the wizard will create a new RLINQ file (Telerik OpenAccess LINQ file) and give it the same Name and Namespace as the LINQ to SQL model. In addition, it will backup the old files. Accepting all of the defaults and clicking next brings you to the confirmation page. From here click Finish and the wizard will do its work. You will see a conversion report come up. Now you will have a new OpenAccess Domain Model in your project. Since your project now has two identically names LINQ classes, it is time to delete the LINQ to SQL class. (Don’t worry it is backed up.) 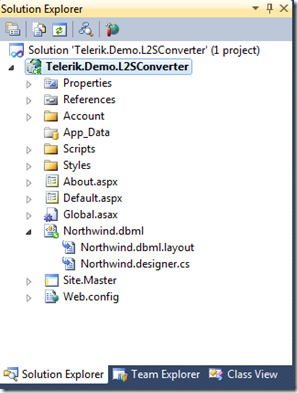 Without changing any code in my application, I press F5 and the project runs, but now using Telerik OpenAccess. I recently wrote a piece in DevProConnections on the recent advances in ORM technologies. While I am still not a complete convert to ORMs, I think that they can play an important role in your application development toolkit. As time progresses and we abstract the database even more, ORMs will become more and more common. You can read the piece here. Back at the PDC 2009 in Los Angeles, CA, Brian Goldfarb showed off the “Microsoft Silverlight Client for Facebook Beta”. It was released by Microsoft in early 2010 and had millions of downloads for both Windows and the Mac. Over the past few months, the Facebook app has been further developed by Telerik and is now available as the first official version under its new name: Telerik f!acedeck. Telerik has taken over the application from Microsoft and will continue its further development and support as a free application for everyone to enjoy. 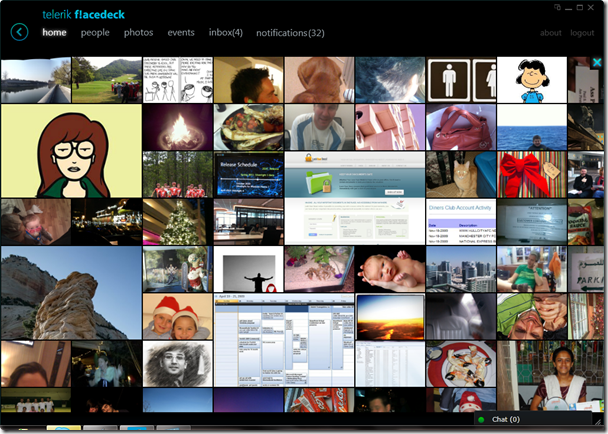 Telerik f!acedeck delivers a superior experience to Facebook users and offers unique features: such as drag-and-drop from the local file system, access to the video camera, instant loading and smooth scrolling of the Facebook wall, notifications and chat. 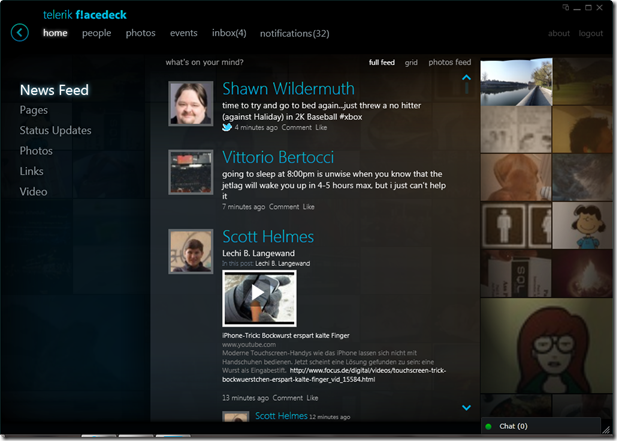 Telerik f!acedeck Client for Facebook is immediately available from its original location on Microsoft’s website (http://www.silverlight.net/content/samples/apps/facebookclient) as well as from Telerik’s website (http://facedeck.telerik.com). The product is free and works on both Windows and Mac OS operating systems with the Silverlight 4 plugin installed. You must register athttps://www.clicktoattend.com/invitation.aspx?code=152298 in order to be admitted to the building and attend. WPF overwhelmed us with the most powerful data binding ever released in a development platform. It seemed there was so much to learn in order to use it, but it really isn't that complicated. However, to use it to its full potential, you really do need to introduce the Model-View-ViewModel pattern. The ideas and goal around this pattern seem to vary from person to person, but the one thing that they all share is that it provides a point of binding for XAML pages. In this session, I'll show you what MVVM is and how to use it and what to put in it, in order to get maximum potential out of XAML binding. I'll even show you how to get a small MVVM Framework going for sharing across all your applications. < Miguel Castro is an architect with IDesign with over 22 years of experience in the software industry. He’s a Microsoft MVP, member of the INETA Speakers Bureau, and ASP Insider. With a Microsoft background that goes all the way back to VB 1.0 (and QuickBasic in fact), Miguel has spoken at numerous user groups, code camps, and conferences throughout the US and overseas. He has also been featured on the technology talk shows, .NET Rocks, .NET Rocks-TV, Microsoft’s ARCast (Architecture Podcast), and The Polymorphic Podcast on numerous occasions. He specializes in architecture and development consulting and training using Microsoft technologies. Miguel is also a regular author with CoDe Magazine.